Vizag Steel Jobs Recruitment Notification 2018.Vizag Steel inviting applications for the positions of Junior Trainee.Interested and Eligible candidates can apply for the positions. 3. Training: Candidates selected for the post will be required to undergo training for a period of twenty four (24) months. During training period, candidates with ITI qualification have to undergo one year Skill Development Course with certification from National Skill Development Corporation, which may be extended for cases where progress during training is found not satisfactory. 4. Stipend: During Training, Junior Trainees will be paid a monthly stipend of `10,700/- (consolidated) during the first year and a monthly stipend of `12,200/- (consolidated) during the remaining period of training.On satisfactory completion of training, Junior Trainees will be considered for appointment on probation to regular post i.e. Technician, subject to availability of vacancies in any Operation / Maintenance / Service / Mines area with a minimum Basic Pay of `16,800 in the pay scale (Pre-revised) of `16,800- 3%-24,110/- (S-3 Grade). Application Fee: Processing fee of `300/- (Plus GST @18%) for General & OBC candidates. 1. Only Indian Nationals need to apply.Only Online applications through website www.vizagsteel.com will be accepted. No other form of application will be accepted.Candidates possessing higher qualifications which are not permissible (as mentioned at “Qualifications” column above) and suppress the same while applying will be rejected. If any of the above shortcoming(s) is/are detected even after appointment, his/her services are liable to be terminated without any notice. 2. The details entered by the candidate at the time of Online registration are final and binding. While applying the candidates should enter their full name as it appears in the SSC / Matriculation certificate.Candidates are advised to ensure while applying that they fulfill the eligibility criteria and other requirements mentioned in this advertisement and that the particulars furnished by them are correct in all respects. In case it is detected at any stage of recruitment process that the candidate does not fulfill the eligibility criteria and/or does not comply with other requirements of this advertisement and/or he/she has furnished any incorrect/false information or has suppressed any material fact(s), his/her candidature is liable to be rejected. If any of the above shortcoming(s) is/are detected even after appointment, his/her services are liable to be terminated without any notice. 3. 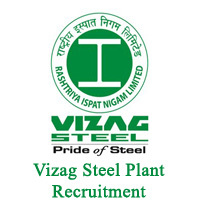 Candidates should visit our website www.vizagsteel.com regularly for list of Employment Exchange sponsored candidates, date of Online test, downloading of Admit cards, date of Certificate Verification etc.Candidates found to be furnishing false declaration / certificate or indulging in malpractices or use of un-fair means or bringing influence during any stage of the selection process will be disqualified and also debarred from participating in future recruitments of RINL.